The success of his Piano Concerto No 4, first performed in 1808, may have induced Beethoven to begin another concerto almost immediately, early in 1809. However, his increasing deafness meant that he was never to play the ‘Emperor’ Piano Concerto No 5 in E flat major, Op 73, in public and although he began a sixth piano concerto in 1815, he reached only part way through the first movement before laying it aside. 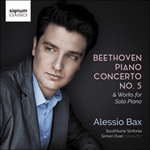 In No 5, Beethoven again breaks with tradition by introducing the piano very early, but this time provides ornate decoration to three emphatic orchestral chords before the main theme gets under way. The second subject is heard first in the minor but then reappears, transformed in the major, and is later heard sounding like a majestic march. In this form, it is accompanied only by two alternating chords, so that the two timpani between them can play the entire bass line (if the music is in the right key). Therefore, as in No 3, Beethoven gives the timpani an important part to play. Another feature that recalls No 3 is that the theme of the slow movement is again a disguised version of the second subject of the first movement—that march theme is now transformed into a serene, hymn-like melody. Again, Beethoven uses a remote key—this time B major—and omits the trumpets and timpani. The music eventually modulates back to E flat major, with a tentative hint of the theme of the next movement, thus providing a seamless join to the finale. Here the theme is announced by the piano before being taken up by the orchestra. The main bass line for this theme uses only two notes, the same two as in the march theme in the first movement, and so it can again be played in its entirety by the timpani. Even in the final coda the timpani have an important part to play. In an extraordinary passage for just solo piano and timpani, the latter picks up an accompanying figure that had previously been played only by other instruments. Beethoven’s remarkable level of invention, whether of thematic manipulation, key relationships or orchestration, remains in evidence right to the very end.